has an oval or round shape with a diameter of 10 cm and weighs between 60 g and 100 g. Its pulp is fleshy and juicy, covered with a thick shell. The pulp contains many small seeds. The skin is sleek and shiny when it is in the process of maturation and wrinkled when it is ready to be tasted. 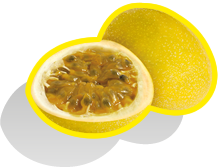 This Maracuya has a bittersweet flavor, very crisp, refreshing, that will delight the taste buds.